He seems to have an invisible touch. As a re-recording mixer, Jim Fitzpatrick has the built-in ability to scope the entire sonic landscape and create an emotional impact that grabs a hold of your heart. Jim shares post-production secrets for mixing, mixing FX, audio repair, restoration, and even shares some career advice on breaking into the biz. How did you get your start in audio post-production for film and television? How do you get from square one to all-time hits like Family Guy? I had spent close to ten years in the music industry before getting into film. I was the Chief Engineer at Westlake Recording Studios, which was always on the cutting edge of sync in terms of being a recording studio for scoring film composers. After a few years I started getting more interested in film and video, doing audio sync work in the studio on several movie soundtracks. I got to work on a couple of Giorgio Moroder scored films, American Gigolo and Cat People. From there, I landed a job as a Film Applications Engineer for Dolby – basically a Quality Control job where I would inspect films and TV shows that were mixed with Dolby stereo process. That was my three-year cross-fade into film and video. At that point Buzz Knudson and Chris Jenkins of Todd-AO, [post production sound company for film], took a liking to my work and gave me the chance to mix. They gave me my first shot with a bullet putting me right on the mix stage of Who Framed Roger Rabbit? which would go on to win the Academy Award for Best Sound Editing. It was also nominated for Best Sound Mixing. So, they threw me right into the fire as a trainee and I handled all the Foley during the mix and helped with the sound effects predubs. After that, they turned me loose! Are there any similarities between a sound re-recording mixer and a music mixing engineer? 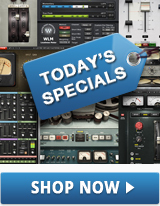 Yes – especially nowadays because of DAWs and plugins, which are the two commonalities you find on just about every system you go in the music and film industry. To go anywhere in either one of those businesses, you’ve got to start out with those. I don’t think I’ve worked on any system that didn’t at least have at least the Waves Gold bundle on it. I recommend starting out in more of the technical aspect of the field. 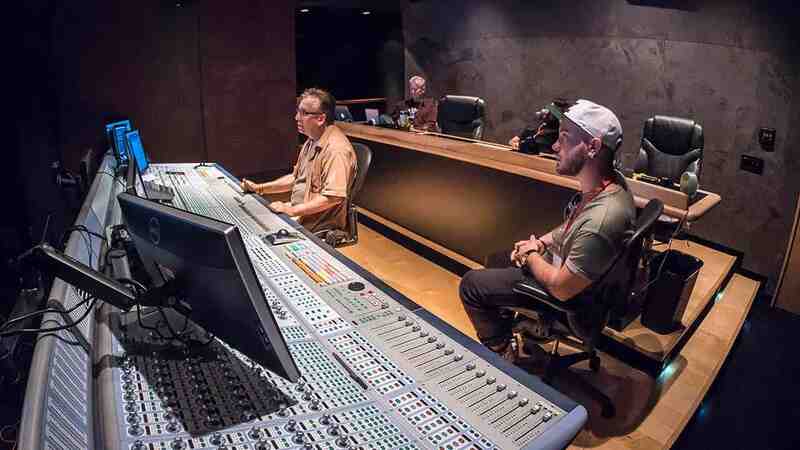 Everybody wants to get in there, turn the knobs, push the faders, be close to the actors and the process. But I found that having the technical skills is the best way to consistently get looked at for work. Being able to do component-level work, troubleshooting, and truly understanding how all the technology comes together. I read many books and manuals before I even set foot in a recording studio. But it was my technical skills that got me in the door. You may think you have an ear for it, but if you have the technical abilities and can make a yourself an expert at those, then you have what the studios really need, and that gets your foot in the door. At Formosa Group’s Stage ‘E’, Jim puts the finishing touches on a mix for American Dad. ‘Dialogue Is King’: How do you add clarity to character dialogue for a Family Guy episode? I do it in layers. I try not to overwhelm my brain with too much at a time. While I’m mixing dialogue, I’m playing the music score at a very low level. I just set the faders real low and let them play along with me so I know how it’s going to interplay with that dialogue. I’ll start out just mixing the principal dialogue, getting it smooth, nice and clear. My basic dialogue chain always starts with the Q10. The thing I love about it is it gives me the flexibility to configure any kind of filter I need at the time. A tight notch, a smooth bell, a shelf, and always a 2-pole high pass. To even out dialogue, I typically use the Renaissance Compressor in ‘smooth’ mode. I like the fact that it can soften up the sound a little bit and it’s very responsive. I usually set the attack and release time pretty fast – we never compress dialogue very much, unless it’s like a radio or telephone effect. I tend to work the fader more during the mixing stage, with a moderate amount of compression inserted. When I need to control any vocal sibilance, I always use either the DeEsser or the Renaissance DeEsser, depending on whether it’s principal dialogue, ADR, or group walla I’m working on. DeEsser has always been the plugin I seem to take for granted. It’s generally set and left – it’s always my friend. For noise reduction I use two things mainly, the Restoration bundle and the WNS Noise Suppressor. 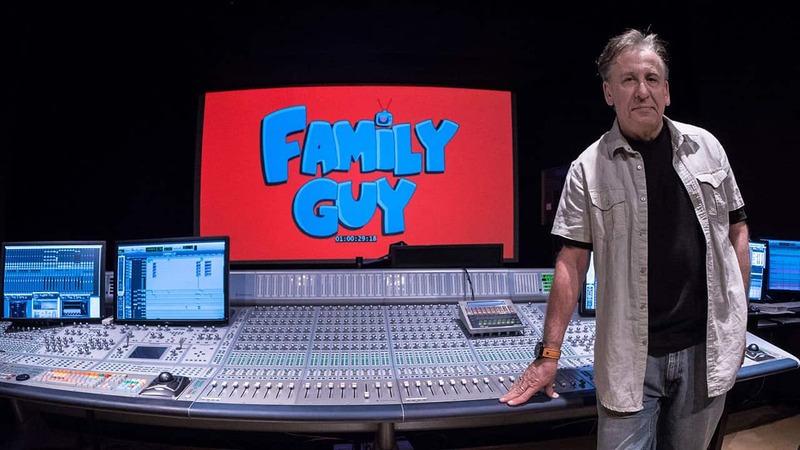 Most of the dialogue I receive for the Family Guy episodes is recorded in a controlled studio environment. But if I’m mixing noisy production dialog, I look no further than the WNS Noise Suppressor. The Emmy-winning episode “Road to the North Pole” features full orchestral numbers. How did you mix the full cast and for the musical numbers in that episode? I received the orchestral recordings from legendary scoring mixer Armin Steiner at Fox’s Newman Stage. Normally, when I sit down to start mixing, I’m getting it fresh from Bob Newlan, the sound supervisor and Stan Jones, the music editor. It’s the first time I’ve seen the show, and I like to keep it that way. It allows me to be a little more spontaneous with any creative ideas. The score comes to me as 5.1 mixes. I have flexibility on the stage to fine-tune the balance between the vocals and the orchestra. I get the individual character dialogue and singing parts separated, and then there are two-channel stems of any choirs, or songs with the full-cast singing. I’m able to decide exactly who I want to bring up front and when; and how to blend it back into the full orchestra. All these separate tracks come to me dry, with no reverb or effects on them, so I add reverb and position them in the 5.1 environment. I use my dialogue plugin chain on each dialogue channel individually, and then across the dialogue, sound effects, and music busses I love to put the low-latency L3-LL Multimaximizer. That’s my favorite bus limiter. Since these shows often push the limits of network level specifications, the difference in apparent level and overall punch is immediately noticeable. In the case of the “Road to the North Pole” episode, we worked with a 30-piece choir, which is something we don’t normally have on those musical numbers. So that was quite an extravaganza! Working the atmosphere: How do you process background walla [crowd murmur effect] in a mix? When I’m mixing walla, I’m typically blending between two different kinds. Some of it will have actual English in it, and then some of it will be just gibberish. As a matter of fact, one of my passions is taking a handheld recorder around the world with me. I record walla in various locations just to get those different language flavors into my sound library. It’s a very subtle thing, but it’s a nice added little touch to have something going in the background that’s got the actual language of the scene location in it. When you layer in any background kind of stuff – crowd dialogues, murmurs in a restaurant – you don’t want anything peeking through too much unless it’s something you’re really supposed to hear that helps the story along. I’ll use the Renaissance Compressor on walla – not to mash it, just to keep it nice and even. And then I’ll put some appropriate reverb on it such as the Renaissance Reverb. It’s important to put detail into things like ambience. I’m a true believer that all those little things you do, they add up and become one big thing in the end. That’s been my approach since day one. How do you make dialogue sound ‘dreamy,’ or like it's coming from inside a character’s head? That’s a combination of things. When there’s a dream voice, or a voice-inside-your-head type of sound, I’m lathering up the sound pretty good with some reverb. I use a little bit of a tight room. When it’s time to have some creative fun with a sound, one of the plugins I love is the IR1 Convolution Reverb. Sometimes I will spread out the reverb a little bit. For a voice inside the head, I’ll position the reverb into the surrounds in the exact same place I’ve put the principal dialogue, so they’re basically a unit. But a lot of times I take that reverb and lock it right to that point source that the dialogue’s coming from. Recently, I’ve been working on a feature film that is shot from the POV of the main character. Waves InPhase has been indispensable for putting the character’s voice inside your head while using a treatment that will be compatible in all subsequent downmix formats. In the “Road to the North Pole” episode, there’s a scene featuring actor David Boreanaz. He appears in the sky as the friendly ‘Aurora Boreanaz.’ For that, I used a little bit of reverb and a little slap-back delay with H-Delay – it’s almost a subliminal thing. From there, a lot of it’s just level and where the camera is. I also mix the reverb and delay into the surrounds; maybe leaning it a little to the right, or to the left. So, it’s that combination of all those things together. Do you have a tip for getting sound FX to punch through in a mix? 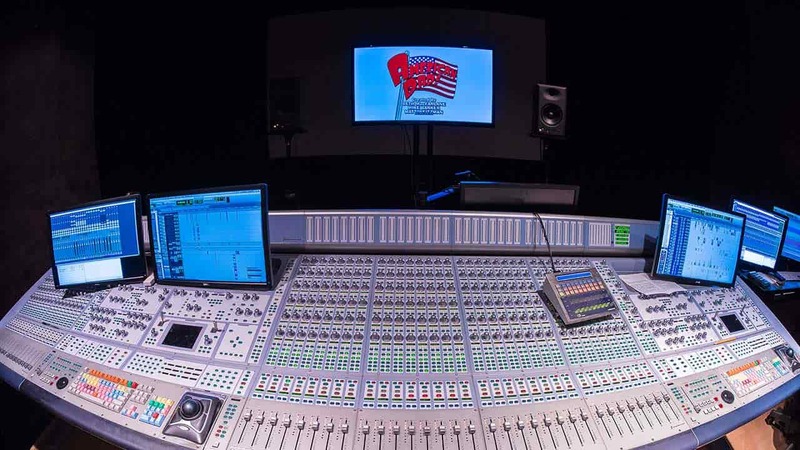 When I work with a sound like an explosion – I don’t know how much of this is a sound mixer editorial secret or not, but I’ll tell you anyway – we often cut a little sliver in the audio file right before that explosion occurs. We cut just a few microseconds of silence right before that explosion takes place. It might not even be a frame wide, but I’m taking all the backgrounds, I’m cutting off any sound that’s ramping up to that first transient of the explosion. I’m just hard-cutting the beginning of it. I may or may not cut the same microscopic hole in the music as well. It’s a trick we use to give your ear just a little bit of time to recover from all the sound that was going on right before – and then the explosion hits. It’s a psychoacoustic trick basically. That hole that you’re cutting, it’s a fraction of a frame, but it makes a giant difference on the impact that you feel from that explosion when it occurs. Then I also decide which elements to spread out with panning, which ones to pass through the center, and which ones to spread out and get that imaging so you feel like you might be sitting right in the middle of it. How long does it take to complete a finished mix for an episode? To get through that whole 22 minutes and have something that’s 98% complete – that’s the first day of the mix, often a 12-to-13-hour day. Bob [Newlan, Sound Supervisor], Stan [Jones, Music Editor], and I do several playbacks, then the show producer comes in and we play it back for him or her. On the second day, the showrunner or executive producer comes in. Once they sign off, that’s it, unless something technical comes up in QC later. Generally, it’s nine months to a year from the time they lock down a script to when I actually get it in my hands. I have a great deal of respect for the time that these people have spent with it and what they’ve put of themselves into it. So, I’ll make it about me as much as I can, but it’s not about me. It’s about the show, and you need to have the ultimate respect for that in this business. Jim puts the final touches on music and dialog during a listening session with Sound Supervisor Bob Newlan and Music Editor Stan Jones. What advice would you give someone who wants to choose this as a career path? Just keep your creative juices flowing. Never let that stop. Trust your instincts, but also be able to pull back and have an objective point of view of your own work. One thing I was taught early in my career by the legendary Buzz Knudson was: “Don’t turn around so much and ask if what you did was okay. You have good instincts – trust them and just do it! People will let you know when it’s not okay!” That attitude stuck with me throughout my career. If you have good instincts – a lot of that I believe has to do with musical background – and your instincts tell you to do something, just take a chance on it. Discover more sound design videos, interviews and tips on the Waves blog.